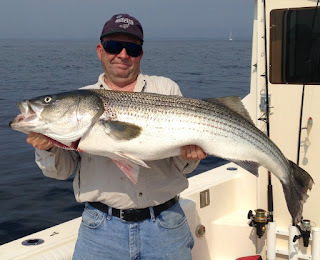 Steve Brustein of Portland, ME with a 30 pound Block Island striped bass he caught Saturday on No Fluke Charters. 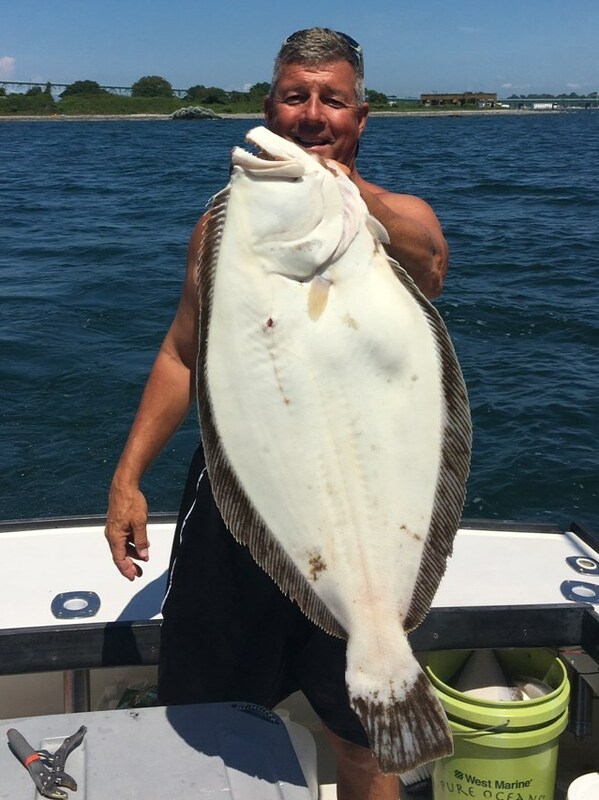 Fluke still holding inshore: Angler Jack Leyden of North Kingstown with two fluke to 22” he managed to catch while fishing in the Newport Bridge area after storms last week. 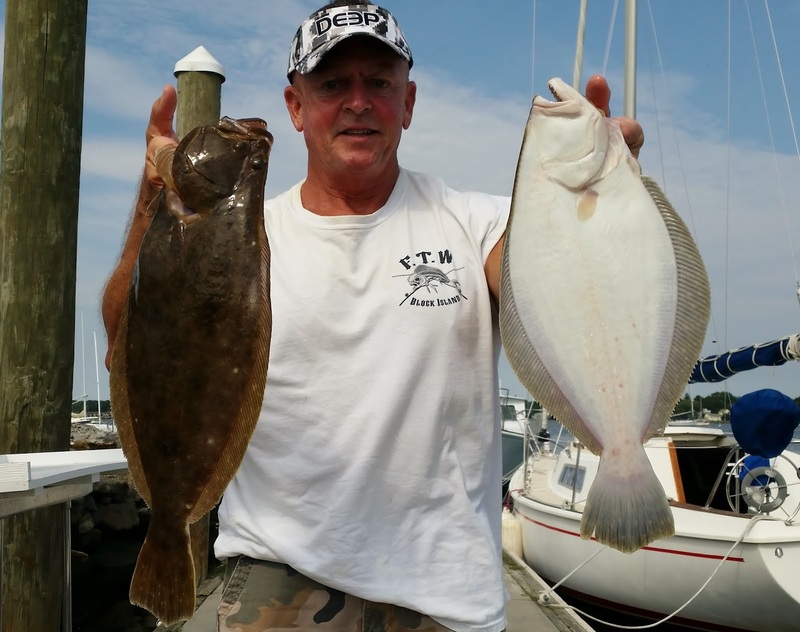 Dave Henault of Ocean State Tackle and Capt. 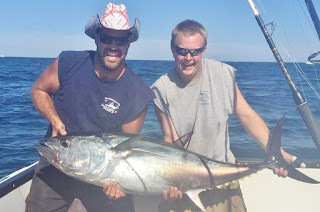 Jack Sprengle of East Coast Charters with the 120 pound bluefin tuna they caught Friday in Cape Cod Bay. The Newport International Boat Show held this weekend was a great success. I attended Sunday under threatening skies and the in-the-water show docks were crowded with attendees. 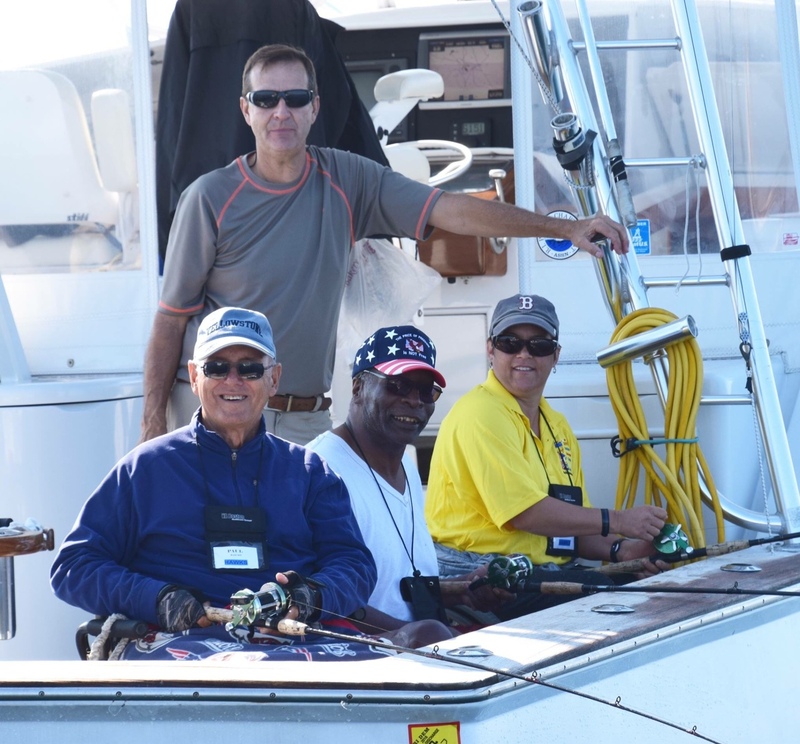 Over 600 exhibitors were at the show with an assortment of boats and a wide variety of accessories, equipment, electronics, gear and services for boaters. I visited the People’s Choice Award Winning manufacturer and checked out a few other exhibits that impressed me. The Nordic Tug 40 foot Flybridge won the People’s Choice award at the show. Its big sister the Nordic 44 Tug took second place in the People’s Choice. The Nordic Tugs on display at the show were getting a lot of attention when I toured them. I ran into three different Nordic Tug owners who were just stopping by to say hello to the Nordic team. One owner said, “You know what makes the Nordic a desirable boat… it’s the fit and finish, just look at this woodwork.” Paul Tortora, sales representative for Wilde Yacht Sales that represents Nordic, said, “Nordic gives you the economy of a displacement hull (2.5 gallons/hour), yet it can comfortably cruise into the mid to upper teens.” The Nordic 40 features a new wider swim platform with a large stern entry door and new this year a second side door at the stern. The Nordic Tug 40 brochure price was $729,950. Visit www.wildeyachts.com for details. The Parker 2510 walk around with a cuddy cabin is a fishing machine. This stable fishing platform has been upgraded with some finer touches such as colored hulls and fabrics. Over the past couple of years they added a stern cockpit door and live well. Tom Grimes, sales associate for Don’s Marine in Tiverton that represents Parker in this market said, “Parker was always a great fishing boat appealing to fishermen. They now have added some touches like hull colors and fabric colors that appeal to women and families.” The 25 foot Parker on display a the show featured a Windlass Package, a West Coast Bow Rail Package, a Sandy Tan Hull and two 200 horsepower engines. The show special price on this 2016 2510 W/A was $132,366. Visit www.donsmarineri.com for details on this Parker and others. Dockwa software application that can find you dockage or a mooring in Newport, Boston, the Cape and Islands, New York and a host of other destinations. Discover and stay in new harbors… just tap, book a slip or mooring. The app works from your telephone or the web. The application can be downloaded from the Apple Store or Google and it is totally free. So book in advance or make a last-minute reservation with Dockwa. Visit www.dockwa.com for details. Zipwake dynamic trim control tabs. These are not your conventional aluminum trim tabs but a system that incorporates a state of the art series of durable, fast-acting interceptors that eliminate the trim problems of planning and semi planning boats between 20 and 60 feet. Zipwake sales associate Dan Schermerhorn of Pro Marine Distributing said, “The system eliminates boat pitch when passengers walk around the vessel automatically and the system automatically eliminates wave resistance which saves fuel and money.” Prices for the system which includes a control panel, distribution unit and their state of the art interceptors that extend and retract as needed start at about $1,800 for vessels 18 to 20 feet. To get a feel for how this system works, visit www.zipwake.com. 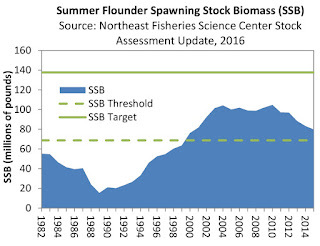 Although most specie advisory panels were eliminated, two remain intact; the Industry Advisory Committee (IAC) that coordinates recommendations from commercial fisheries sectors and the Shellfish Advisory Panel (SAP) which provides recommendations to the Council on all shellfish-related matters. The RIMFC also welcomed two new councilpersons to their first meeting; Michael Roderick, an executive at Town Dock, Narragansett and Travis Barao of East Providence, a recreational fisherman and a member of the RI Saltwater Anglers Association (RISAA) board of directors. For information on RIMFC meeting material and minutes from past meetings, visit www.dem.ri.gov . 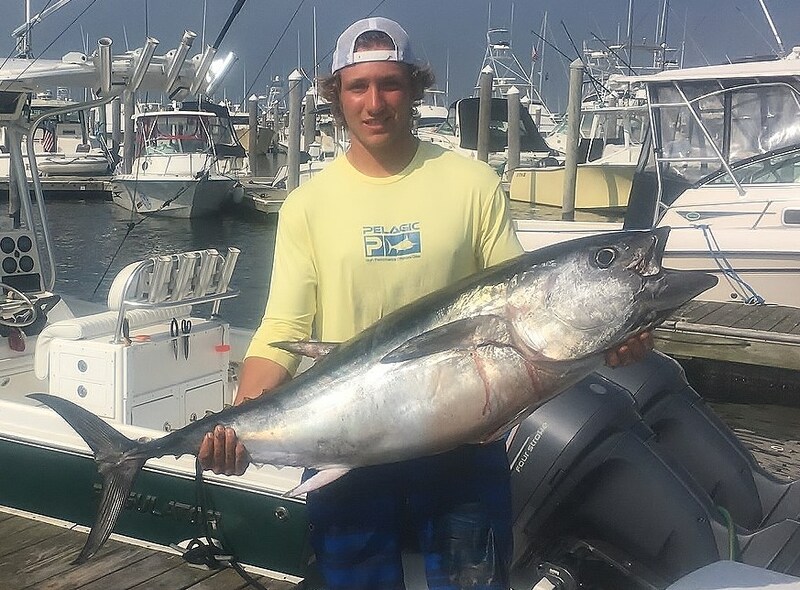 False Albacore. “ The albie bite from shore at Pier Five, actually anywhere from Narrow River to the West Wall has been outstanding from shore. One customer caught 50 false albacore from Pier Five. Most people do not eat them but I have some customers that like eating them. 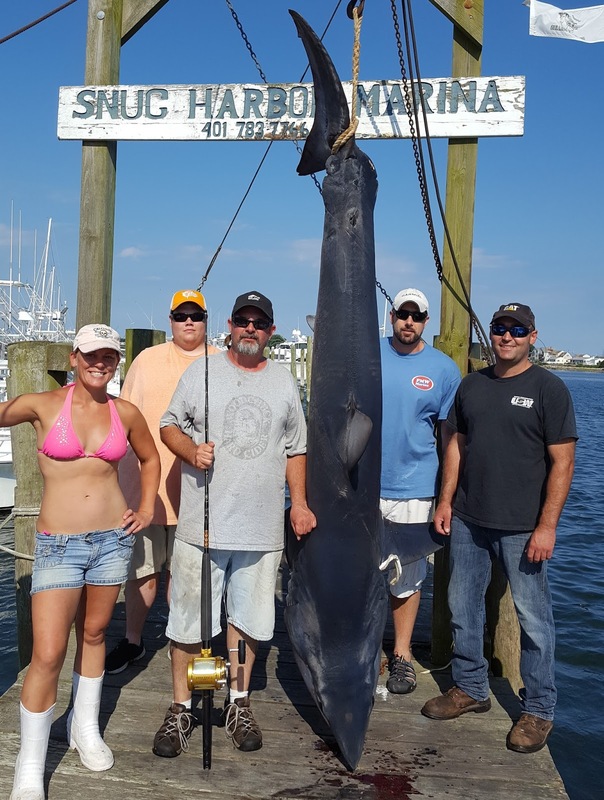 They prepare them using coconut milk.” said Dave Henault of Ocean State Tackle. Newport Blues: Angler Steve Brustein of West Warwick with one of four bluefish caught when a school surfaced in front of 1st Beach, Newport. The fish were bled and iced in minutes ready for the smoker. 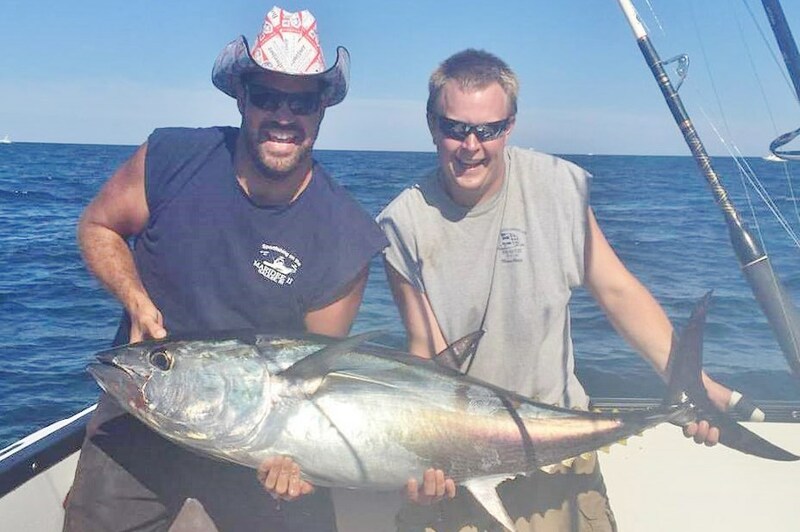 A storm like the one we had this past week can change fishing a lot. Some species may leave the area totally. Yet others species just won’t bite. They may not bite because the water is dirty with sand and mud that either irritates the gills of fish so they stop moving around and feeding or they simply cannot see your bait in murky, cloudy water. 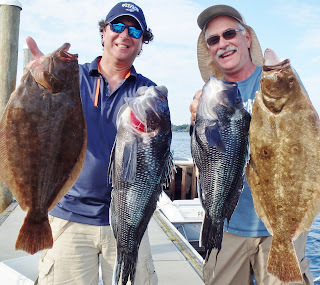 At press time the water has started to clear so hopefully by the weekend anglers will be able to fish for species such as black sea bass, striped bass, tautog and cod fishing which has been experiencing a fairly good bite close to shore. 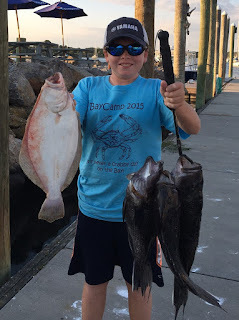 The Pabst Blue Ribbon catch and release striped bass, bluefish and summer flounder (fluke) tournament ended August 20th. 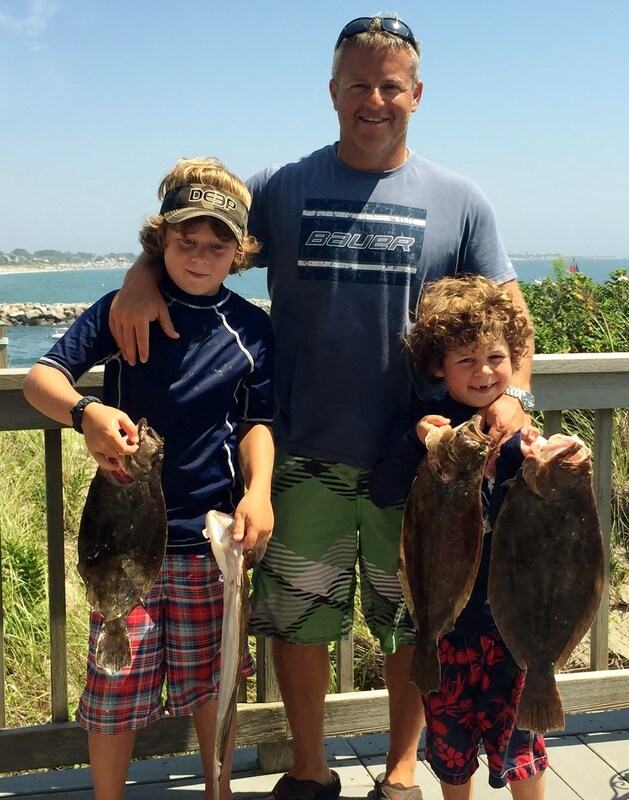 To be eligible for the season ending cash prizes, a minimum of three fish had to be caught and released. 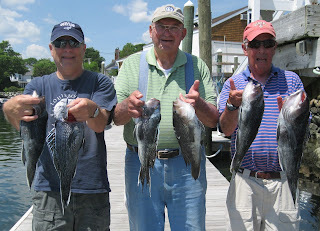 The length of the longest three fish in each specie category makes up an angler’s total entry. Last week after all winning candidates passed a polygraph test the results of the competition became final. Tournament winners: Striped bass category winners were Russell Zivkovich, 150”, $5,000 cash prize; John Hanecak, 149.5”, $1,500; and Keith Darrow, 147.5”, $500. 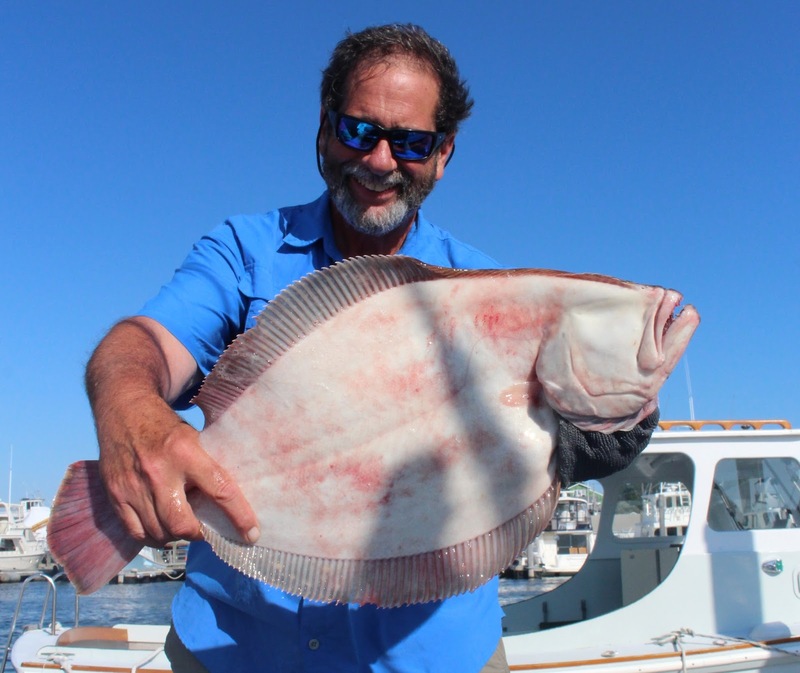 Summer flounder (fluke) winners were Gary Stephens, 87”, $5,000 cash prize; John Davis, 83”, $1,500; and Howard Ward, 74”, $500. The bluefish winners were Russell Zivkovich, 110.25”, $5,000 cash prize; Al Tremblay, 108.50, $1,500; and Gary Stephens, 108.25”, $500. Visit www.pbrfishing.com for details on the September 25 celebration event and for a listing of Junior Division winners. 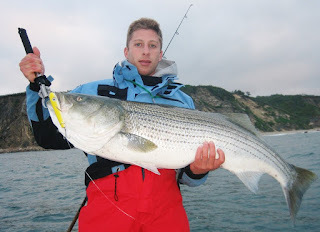 Striped bass fishing remained very strong last week. Angler Eric Appolonia said, “We fished with eels on the Southwest Ledge at Block Island just before and after high tide and did very well last week.” Matt Conti of Sung Harbor said, “The commercial season opens again this week so I am sure we will have a lot of fishermen targeting striped bass as soon as the weather clears.” Fishing for striped bass can be hit or miss as the fall migration starts. Schools of fish move in and out so someday the fishing can be good and other days it is not good. 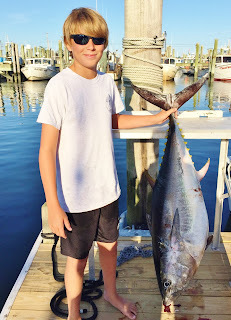 “Yellow fin tuna fishing on our first trip of the season was successful last week as anglers caught fish in the 50 to 70 pound range drifting chuck bait during the day. The trips will be run into October.” said Capt. Frank Blount of the Frances Fleet. Capt. Mike Roy shared tips Monday on how to catch fall striped bass using light tackle. Cameron Sears (age 12) of Seekonk, MA caught black sea bass and fluke off Pt. Judith Saturday while fishing with Jack Leyden of North Kingstown. I looked across the room Monday night and in the audience I spotted Peter Vican. Peter is a well respected fisherman in Rhode Island and is the state striped bass record holder (77.4 pounds). He was listening intently as Capt. 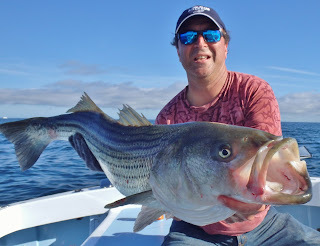 Mike Roy from Connecticut shared his technique for fishing a reef for striped bass. Capt. 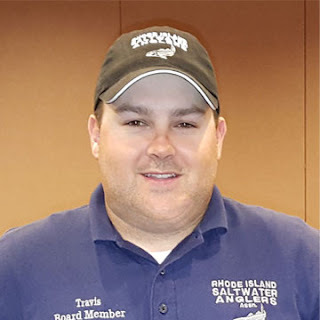 Roy had the full attention of Peter Vican as well as 200 other fishermen who came to listen to him at a RI Saltwater Anglers Association meeting at The Villa Restaurant, West Warwick. Capt. Roy shared his knowledge of fish and the new, exciting and effective techniques he has developed to land fall run fish (striped bass, false albacore and bonito) on light tackle. 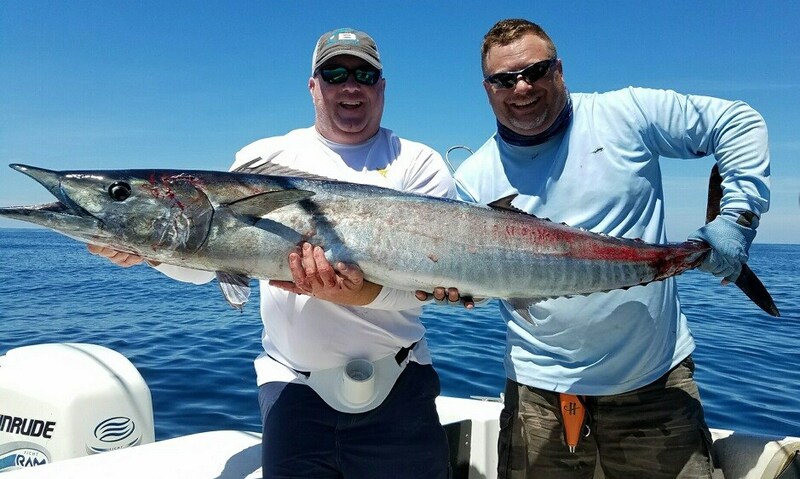 Here are some light tackle tips Capt. Roy shared. His standard rig uses 50 pound braid line with a seven foot 50 pound monofilament leader tied directly to the braid so he can cast and reel more effectively than when a swivel is used. His seven foot rod is custom made by him and last year he started to use Shimano reels exclusively. He using J hooks rather can circle hooks and pays attention to the hook set so fish are not hooked in the gut. Believes in using no weight with eels (as he often fishes in low water, 15 feet) but does weigh them down with slip shot (small pieces of lead) when ne needs some weight to get them down. He is a firm believer in maintaining contact with the bait to know when you get a hit and to prevent the eel from burying itself in structure below. For additional information visit Capt. Mike Roy’s website at www.reelcastcharters.com . 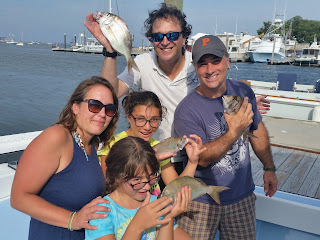 The bluefish bite off Sabin Point and Barrington Beach has been very good. Chris Catucci of the Tackle Box said, “Customers are catching some bluefish of size using poggy (Atlantic menhaden) chunks as bait. We also have a lot on anglers catching skipjack bluefish in coves and ponds and inlets. 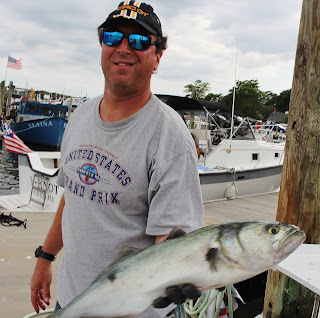 John Littlefield of Archie’s Bait said, “Bluefish are being caught in the Rivers. In Pawtucket we have pogies three feet thick and some bluefish have worked their way up the river to feed on them.” Reports of blue fish running at Block Island an along the southern coastal shore from Charlestown to Pt. Judith with some striped bass mixed in. 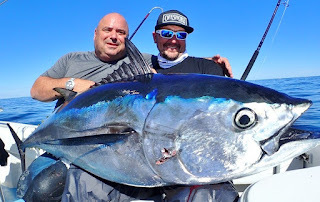 “Bonito have been running hot from the West Wall at the Harbor of Refuge to Watch Hill with the West Wall and Weekapaug areas being the hot spots.”, said Mike Wade of Watch Hill Outfitters. 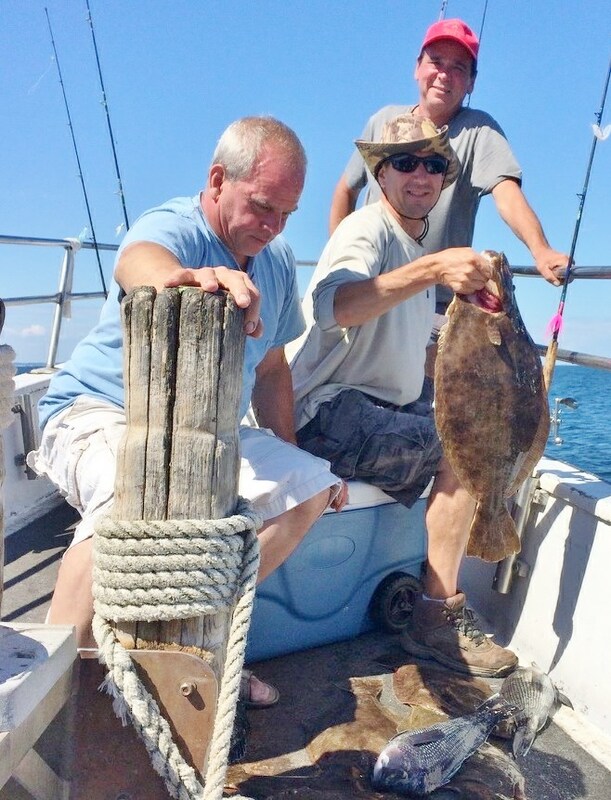 Tautog fishing has started to pick up as anglers are targeting them early than usual due to a soft fluke season in shore. 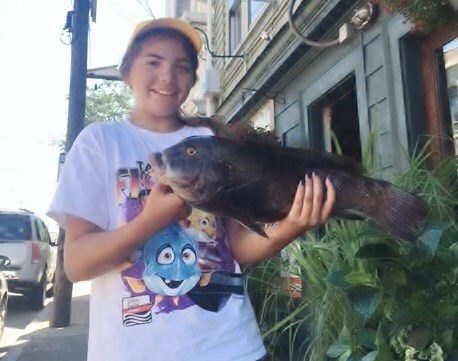 Dave Henault of Ocean State Tackle said, “Tautog are hitting Asian crafts with a fair bite off Jamestown and Newport.” Sophia Garzoli weighted in a 5.7 pound tautog at Ocean State Tackle that was caught with Asian crabs off the West Wall of the Harbor of Refuge.